Home » Articles » How Much Food Should I Feed My Kitten? When you bring home a new kitten, it can be the start of a long and happy relationship. However, it’s also a big responsibility. One of the most important things to get right for your kitten is diet – after all, eating well is vital to grow into a healthy cat! The first decision is whether you want to feed your kitten dry or wet food, or a combination of the two. If you do feed your cat a combination of both, then it is important that the total daily nutrition is still balanced and that your kitten isn’t overeating. A good approach is to use wet and dry versions of the same brand, then you can follow the manufacturer’s instructions on combined feeding. It is important that you feed your kitten a complete cat food formulated for growth. A complete cat food is designed to provide your cat with all the nutrition and energy he or she needs, alongside the correct balance of nutrients. This means there is no need to add anything to the diet. Adding supplements and extra foods, for example chicken or tuna, could in fact upset the nutritional balance. You need to ensure that your kitten is fed a diet specifically for growth and not an adult diet. Kittens have very different nutritional needs to adult cats. Follow the feeding guidelines on the pack to determine how much food your kitten needs each day. However, you do need to monitor your kitten’s body as it grows – adjust how much they’re being fed accordingly to keep them trim. 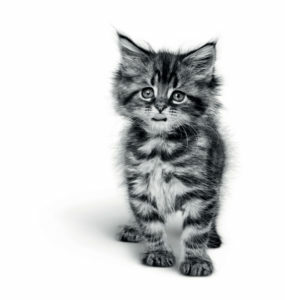 If you need help, your veterinary practice will be able to assess your kitten’s body condition. Cats prefer to take several small meals a day – this is particularly essential during growth. If you are feeding your cat a dry diet then you can leave their food available for them to access frequently, but if you do this you need to ensure you keep to the daily ration. For wet food, small frequent meals throughout the day will be necessary. We hope this article helped to answer your question on how much to feed your kitten, as well as offering some other information about kitten nutrition. However, if you’d like to know more about kittens, nutrition and cat health in general, then sign up for our newsletter below to receive more helpful information.